This morning whilst I was walking with my friends I remembered a very funny incident (actually more than one) that happened when I was younger it was probably about 15-20 years ago so I was in my late 30’s early 40’s…. I thought I would share them with you! It was back in the days when my husband had a ‘company car’ and he had chosen the most beautiful, Saab convertible!! It was the first (and last) convertible that we’ve had the pleasure of! Well, the Hubster went to collect it and I waited at the lounge window in anticipation, .. I could see him entering the drive and watched with pride as he pulled up, the most massive, black, beast of a machine….I rushed out to study this animal at close quarters. Wow!! It was stunning, it had cream leather interior and the smell was just delicious. It was most definitely a huge improvement on the old, burgundy, Ford Siera Estate that we’d just disposed of!! It needed filling with petrol so we decided we would go together and fill her up. It had an electric roof so we lowered it whilst we were sat on the driveway and “oohed” and “ahhed” with delight as the roof silently lifted up and folded back on itself behind us at the touch of a button…. As we drove along, I felt like a Hollywood movie star – my hair flowing in the wind, but no one told me that your hair doesn’t actually flow backwards…the draught caused by driving makes your hair whip around and slap you in the face, stinging with every lash!! Then (and yes I know it’s meant to be lucky!) a low flying bird dropped something from up on high which landed squarely on my head and dripped down through my hair and onto my shoulder….now that doesn’t happen in the movies or the adverts does it? We filled up with petrol and the Hubster went off to pay, I was suddenly aware of all the attention the car was receiving….we lived in a very small town and to my knowledge there hadn’t been another of this type of car there before…..I felt extremely vulnerable and uncomfortable with no roof to hide under I can tell you. I might be an extrovert but I like the attention on my terms!! Ha ha!! As my husband walked back to the car I could see that he had a lovely smile on his face, well you know the kind of smile (the one you try not to show too much) he was as pleased as punch with his new toy. He put the key in the ignition and nothing….we sat for a good couple of minutes trying to work out what was wrong, was the new toy broken already? I ended up quickly reading through the manual….How to start your car?…. If my memory serves me right with the Saab, we had to make sure the car was in reverse gear or it wouldn’t start!! I’m glad to say eventually we got it started and off we went, feeling rather (in fact a lot) silly! We had one of our very best holidays ever in that car – we crossed the Channel went to Belgium drove down to the South of France through Switzerland. The car was the star until we ended up in Monte Carlo where in all honesty it looked like a rubbish skip as we parked it next to some of the most incredible cars down there. On one occasion we turned up at a hotel where the valet came out and took our bags and informed us that there was a car park around the corner if we would like to park it he would ensure our bags would be taken up to our room!! (Ooooh those were the days!!) Anyway off we went round the corner and a sign for the underground carpark….in we went…it was cool and dark and it was a welcome relief after having driven for a fair few miles in the blazing sun with the roof down. The car itself was quite long for a saloon and the Hubster did a sterling job of driving down two floors around the dark and very tightly twisting spiral drive…we found a space and manoeuvred into it, it was quite a feat and by the time we were parked up, we were in quite a sweat. Never mind we would make our way to the hotel and have a shower and a well-earned relax. 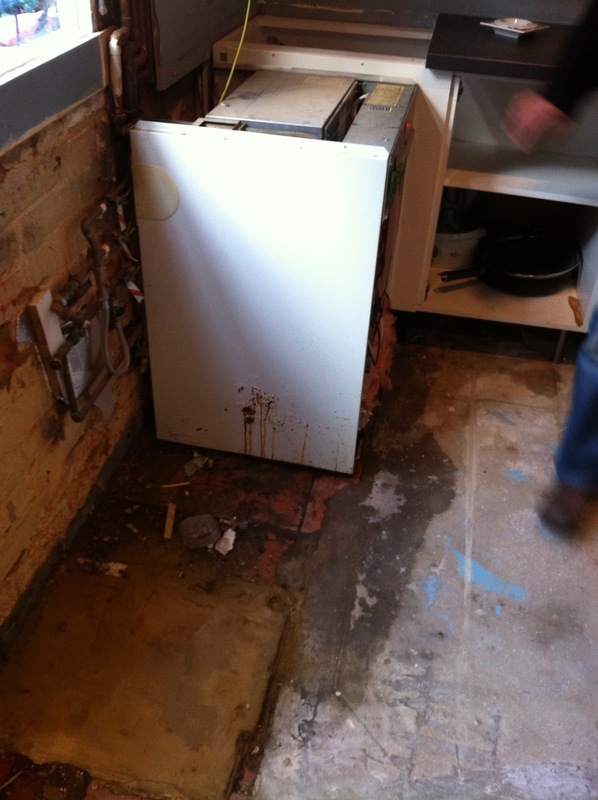 Right, let’s close the roof, we pushed the button and up it went, fantastic, then a terrible scraping sound…yup that’s right the ceiling was so low that the roof got wedged on the ceiling and wouldn’t go over and it wouldn’t go back into place either!! My poor husband had to reverse all the way back up the spiral in the darkness with the roof half up and half down not being able to see out of the reversing mirror with me behind shouting “Left a bit” “right a bit”….with the occasional shriek of “STOP” thrown in for good measure!! Another time I took my Mum shopping and parked up no problem, did our shopping, went back to the car and by this time other cars were parked up rather closely to the beast. Never mind, I’ll take the roof down so I can see what I’m doing, a small crowd congregated to watch it…. far too embarrassing! Well, you know you have to do a 3 point turn when you pass your test…..I did a 26 point turn and got the car well and truly into a position whereby I could no longer go forward or backwards….the crowd had grown, my mother was the colour of beetroot and kept slipping down on the leather seats!! I got out of the car, hot and sweaty and surveyed the group, looking for my victim and saviour all in one….there he was, a big burly guy with a smirk on his face, I beckoned to him, and asked if he could do a better job, he smirked again, I can’t remember what it was he said exactly but it was very flattering and it did include the words, “women drivers” – with that I opened the driver’s door and invited him to do a better job, my mother was mortified, she was now physically shrinking in size! I joined the crowd and watched this chap go back and for, back and for…until eventually he gained a couple of inches either end of the car and got it into a position where I could drive out, the crowd applauded@!!! I thanked the guy as he got out of the car, pleased as punch that he’d succeeded, although it did take him at least another 15-20 manuevers to get it out! I got behind the wheel and shot off like a woman demented my mum slid back in the chair like a wet fish….poor love! Well that’s just a couple of tales – there are more but I want to keep my embarrassing exploits to a minimum….or I’ll lose any street cred that I may have had. The funny thing is, our life has changed, the Hubster is now self-employed and times is tough (as they say). We don’t have the flashy car and we can’t afford the posh hotels or the lengthy holidays. I have a VW golf which is adorned with many scratches and dents!! I’m proud of them….it’s shows character!!! I’m so glad we had the experience to own the beast and to have tasted the fine life, I can’t say we’re happier now than back then but we are as happy however the life we lead now, is more grounded and honest and we appreciate things so much more. 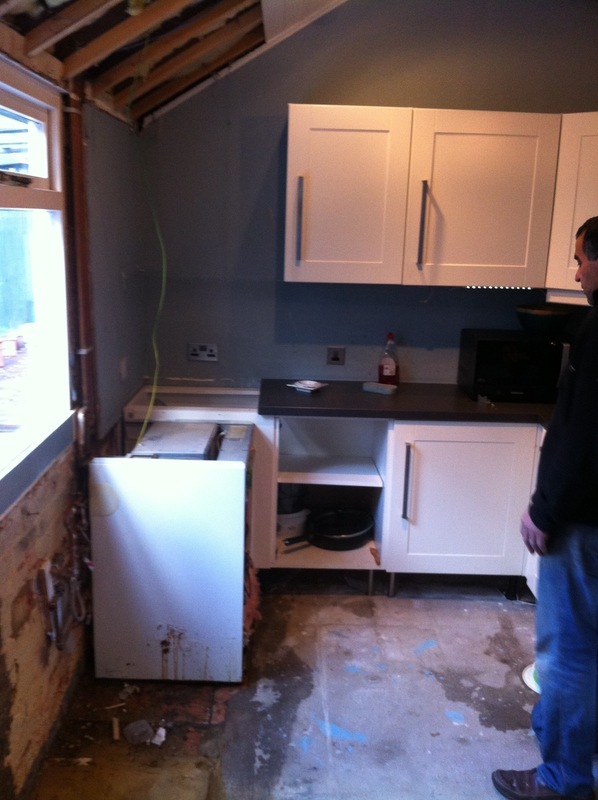 And so my photo for the day, is proof of that….you remember my lovely kitchen…well this is what it looks like today!!! And I really don’t care, it’ll be sorted when it’s sorted…it’s not important! This entry was posted in Photos, Postaday2012, Thoughts, Uncategorized. Bookmark the permalink.